With more than 5 million Instant Pots sold, these multicookers are more than a consumer craze. They have fundamentally changed the way many families put food on the table--and more! Because of the incredible versatility of this kitchen tool (which combines a pressure cooker, slow cooker, rice cooker, yogurt function, steamer, and more in one pot), Instant Pot devotees are on the hunt for a big selection of recipes they can rely on. Building off decades of experience creating recipes that help home cooks deliver on flavor without much time or hassle, bestselling authors Bruce Weinstein and Mark Scarbrough bring you the key to unlocking the full potential of your Instant Pot. This book is the first to feature fast-and-slow timings for recipes: use either the pressure cooking or slow cooking function! Better yet, most recipes require no complicated extra steps: once you open the lid, dinner's ready. 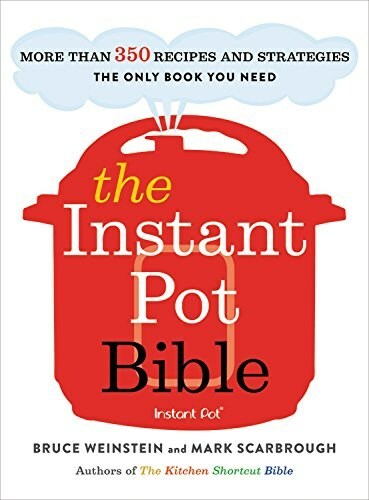 With easy-to-follow instructions that produce delicious results every time and more than 350 time-saving recipes for ragus and chilis, pastas casseroles and pilafs, comfort-food braises and weeknight risottos, and even the best cheesecake you've had in a long while, you'll discover the true power of the Instant Pot--and feed your family in a flash every night of the week.